High-frequency (HF) radar communications rely on the upper atmosphere of the Earth acting like a reflector for some of the radio waves in the HF spectrum (frequencies between 3 and 30 Megahertz). JORN monitors the HF spectrum to track objects across Australia's northern and western air and sea approaches and plays a vital role in supporting the Australian Defence Force's air and maritime operations. In the past, JORN has only been able to focus in on a single radar channel at a time, limiting its capability. DST engineer Geoff Warne says that the common aperture receiver that has been developed receives almost the entire HF spectrum at the same time, allowing tasks to be run in parallel monitoring different aspects of the ionosphere and simultaneously tracking multiple radar channels, each with full receiver aperature gain. In developing this exemplar system, DST has proven the concept and showed how JORN performance can be improved and expanded, allowing the recently announced JORN Phase 6 Development to leap forward. Providing industry with this starting point has ensured significant costs savings for Defence while also significantly reducing the technical risk. The team overcame a design challenge that required very low internal noise with a highly linear response across the HF spectrum. Significant effort was also expended developing a sophisticated "digital back end" which allows the operator to focus attention on different channels. 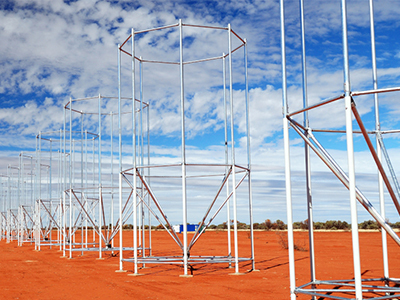 New radar technology developed at DST is initially tested in the lab using simulations, before comprehensive field trials. If all goes well it transitions to the JORN system. "In this case, we've built a full set of common aperture receiver gear," says Warne. "That will now be transitioned into a role where it can be used to evaluate any receiver that the contractor builds." That's of great value to Defence, which would otherwise have had a challenge verifying that any new system met the requirements specified for the JORN upgrade.